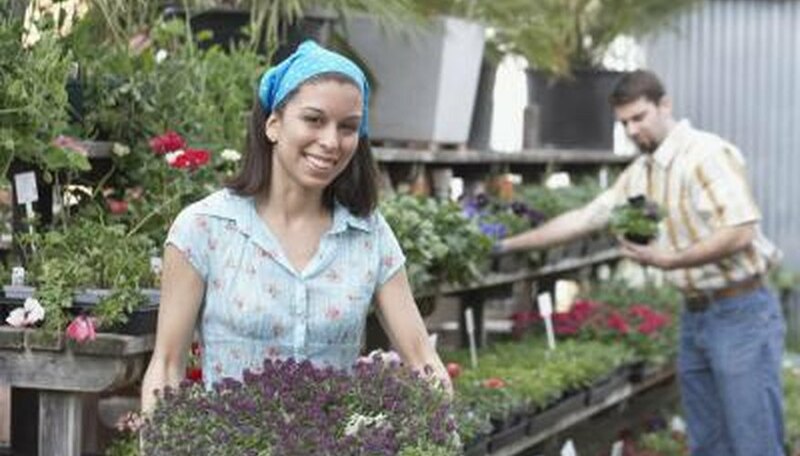 Plant nurseries must be designed for efficiency and maximum production. Any time used while workers walk around an inefficient layout or customer traffic is disrupted can translate into a cost of doing business. This is important because the nursery business has competition from the biggest and most competitive department store businesses and suppliers in the U.S. Customer parking is an important part of the nursery layout. A nursery business is unique because almost all the merchandise is dirty, cumbersome and heavy. If employees are hired to assist the customers and help carry merchandise to their cars, the employees must be able to return to another customer quickly. This is especially important during the busiest season, which is usually spring. Provide a private area for an office that includes computers and other record keeping materials. The area could possibly include a safe to store cash for opening the business and important documents. The checkout area must be spacious enough for a line of customers pushing large carts or wagons. If carts or wagons are not provided, then customers must have someplace to set the merchandise. Customers cannot be allowed to stand for any length of time holding a heavy product. The production area will contain potting soil, equipment and chemicals that the customers cannot contact for health and safety reasons, so this area must be separated from the display area. It should have large workstations available at the correct height for the employees so there is no strain on their posture. The display area should have tiered shelving for smaller plant display with the top shelves easily reachable and an area with covered ground for larger plants and shrubs. The ground under larger plants must be covered to prevent weeds from growing around the merchandise and to stop insects and diseases from entering the planting pots. Also, aisles must be provided and designed in a way that customers can pull the product without interfering with customer traffic and there are no dead ends. Design a separate entrance for equipment delivery and storage facilities. Fertilizers, chemicals, potting soil and fuel take up a lot of room and can be dangerous. Pathways and driveways should be paved or graveled to prevent mud from forming around the facility. A plant nursery operation cannot survive without irrigation. A water source must be secured from a well or local water supply. If a well is drilled, access must be available to the well head at all times for emergency maintenance. Spigots with attached water hoses should be numerous throughout the facility. A water hose accidentally dragged across plants can do a lot of damage quickly. Consider automatic and drip irrigation for larger operations.